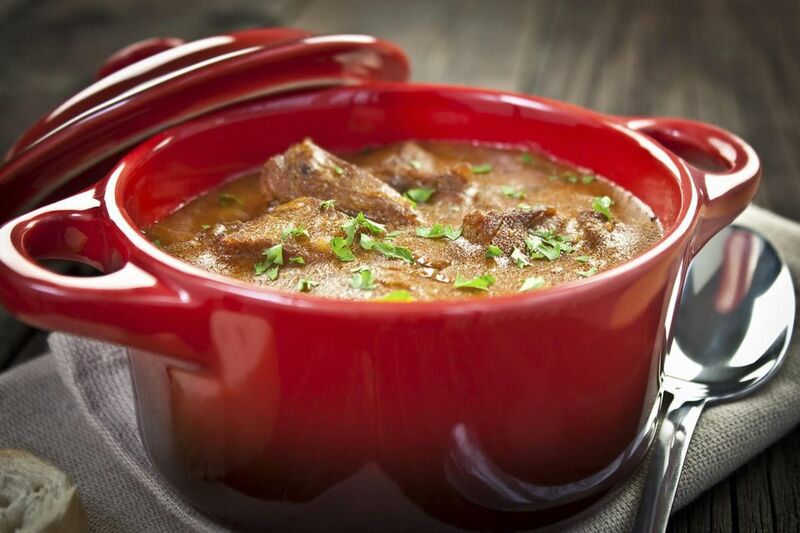 This goulash recipe uses two types of Hungarian paprika, sweet and sharp, to achieve a mildly spicy stew. Adding sauerkraut and onions stretches the meat and tastes great. Szegediner goulash is a regular German potluck item. Prepare the meat by cutting into bite-size pieces and removing all hard fat or sinew. Toss the pieces with 2 tablespoons sweet Hungarian paprika, 2 teaspoons sharp Hungarian paprika, 1 tablespoon oil and 1 teaspoon salt. Add black pepper to taste and let it marinate for 15 minutes to 1 hour or more. Cut onions into half rings and chop garlic. Heat 1 tablespoon oil in a skillet (or none, if non-stick is used), add meat and brown on all sides. Add onion and brown for 3 minutes. Add the rest of the paprika to taste (sharp paprika can make the stew fairly hot, so be careful). Mix in garlic, red wine, and water. Cook for 2 hours, or until meat is tender. Add sauerkraut and cook for 30 minutes. Serve with boiled potatoes or noodles. Optional: Add the slurry of flour and water and bring to a boil to thicken sauce. Either stir in 1/2 cup of sour cream and heat through, or serve sour cream on the side. Buy both kinds of paprika at The Spice House in Chicago or Buy Direct from Amazon.